8 Comments to "Top 10 AGW Denial Myths"
In my limited knowledge of the subject, I think there’s something at play relating to some of the human made air pollution and the increased temperature. Awhile back, I recall a piece saying that a reverse trend can develop. As explained, the melted ice areas lead to more water, which serves to cool the air temp. Of possible interst, I just received a note claiming that there has been a global cooling trend since 1998. A news weatherperson recently said that the cool North American east coast spring weather is likely to even out with a warm September and October. I recall a prior instance, where a weather expert said that global warming doesn’t necessarily mean hotter summers. Rather, an overall average warmer over the course of a given year scenario. According to this source, the greater disparity is to be found in the night time temperatures. I don’t recall the reasons given for this claimed predicament. Re-“melted ice areas lead to more water, which serves to cool the air temp”. That is nonsense. First, for obvious reasons water is warmer than ice. Second, when there’s ice a lot of the solar energy goes into melting the ice – rather than heating the surroundings. Third, and most importantly, the albedo of ice is around 90% – whereas that of dark blue water is just 20%. This means that open water is going to be absorbing a great deal more heat, rather than reflecting it back into space. Re-cooling since 1998. That is a good example of selective curve fitting on the part of deniers, because 1998 was an anomalously hot year due to a strong El Niño. NASA global temperature measurements – note the sudden jump in 1998 by 0.3C and retreat, followed by a resumption of the secular warming trend. Note that 1998-like temperatures have become the norm since 2002, while 2005 and 2007 were actually slightly higher. In fact, even cherry-picking the starting year to be 1998 will reveal a positive though slow warming trend. Instead of selectively picking years that are good for your case, it is more appropriate to use the method of moving decennial averages, which shows absolutely no deceleration in global warming. (Also note that solar intensity has been declining since the early 2000’s, and that aerosol emissions – which partially block out the Sun’s rays – have been rising across east and south Asia. All other things like CO2 being equal, this means temperatures should have, if anything, fallen, in the past few years. But instead they remained on a slightly positively inclined plateau. 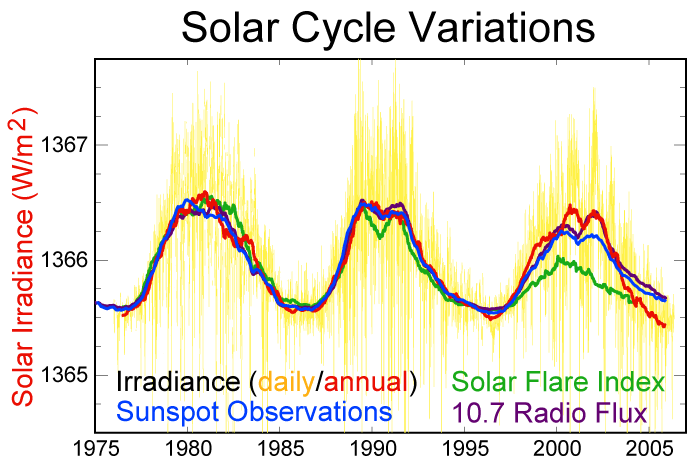 Given that solar intensity cycle should entering its rising phase right about now, I expect a noticeable intensification of warming in the next five years). Mark Lynas also has an excellent article on this matter, Has global warming really stopped? This graph shows what kind of pattern linear curve fitting exercises over 8 years can yield for the last 30 years. Note how the very last “8 year cooling trend” could only be discerned for the 1987-1995 period. Re-uneven warming. Yes, that’s true. Winters will warm more than summers, and nights will warm more than days. I imagine it’s simply a function of heat diffusion – a thicker greenhouse blanket will serve to increase the Earth’s insulation, meaning less heat is lost to space during periods of darkness. PS. One last note, this time re-Arctic ice cover. 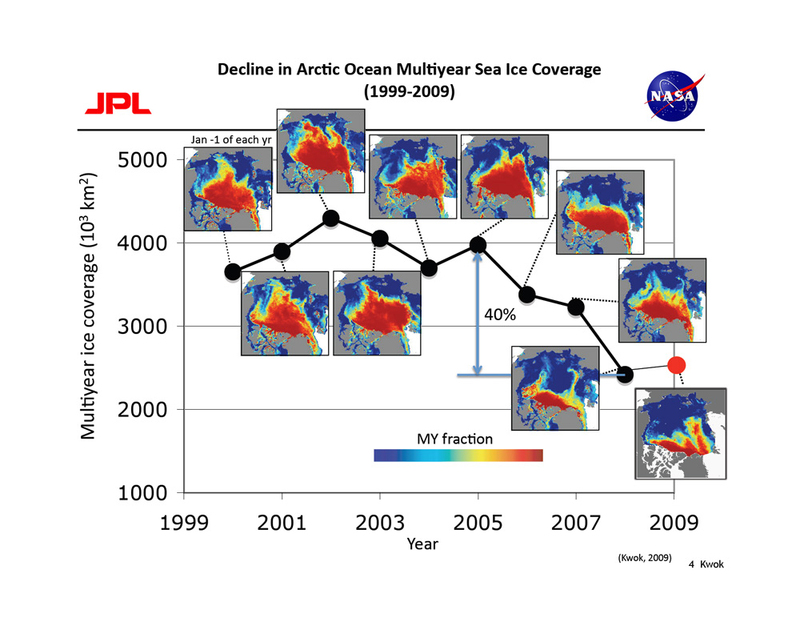 It is certainly in rapid decline, with a tipping point in multi-year ice coverage reached in 2005. Why is Greenland called Greenland? Why are there places in Europe with wine in the name, in areas where wine normally doesn’t grow? Why have I registered news of ice caps melting on Mars? Didn’t the modern man burst out of the African Savannah and thrived after ice caps melted 10 000 years ago? I must say I am sceptical of the AGW, but even if it was an uncontested truth, what are we to do? Are we to feel sorry for the industrial revolution that eventually allowed us to use computers instead of pen and paper, commute to work on a car or a train (yes production of trains as well as their powering generates CO2) and go from Europe to America in 8 hours instead of spending days on a ship? It is sad that the debate is largely political. The environmentalists seem to be just as hypocritical as the conservative deniers. I would certainly not mind if Central London only had electrical cars and buses only. It is sometimes a choke zone with the famed double-deckers being the smelliest of them all but giving people carbon allowances nationwide makes me worried. On the other hand if the conservative deniers had their way London’s choke zone would probably get worse. A compromise between these two discourses would be a blessing. "Why is Greenland called Greenland? Why are there places in Europe with wine in the name, in areas where wine normally doesn’t grow?" Well, I'm Norwegian. We gave the names Iceland and Greenland. If you look at pictures from Greenland in summertime, it's actually green there. But there's also ice. (The climate on Iceland has always been milder than on Greenland because of the Gulf stream, so if it's icy there then it's also icy on Greenland). As for the Old Norwegian (Norse) word "vin", it means grass plain. Thus, "Vinland", the name the Vikings gave to America, means (grass) plain land. You can find the same word in lots of places in Norway, for instance Granvin (pine tree plain) and Björgvin (the older name for Bergen, birch plain). Besides, everyone in the Norse settlement on Greenland actually died 600 years ago because the climate was so bad. And where are the frozen remnants of shrubs and trees from 1000 years ago if the climate was warmer then? Face it, you're in denial, and denial isn't good for your mental health. The problem is not with CO2 per se, but the fact that its levels are rising so quickly at rates unprecedented in geological history. This threatens to unleash change so rapid it would be impossible to curb it or adapt to it. It’s quite possible that within a few tens of thousands of years of the current warming spike, the deserts will green up and the world will become a very lush, hot and sticky place. But it won’t be of much use if in the next century industrial civilization collapses due to the twin shocks of environmental degradation and drawdown of concentrated energy resources. Congestion charging is entirely separate from the AGW debate. The issue there is excessive smog, which blights the lives of those in its locale but has no major global consequences. Well, I’m Norwegian. We gave the names Iceland and Greenland. If you look at pictures from Greenland in summertime, it’s actually green there. But there’s also ice. (The climate on Iceland has always been milder than on Greenland because of the Gulf stream, so if it’s icy there then it’s also icy on Greenland). As for the Old Norwegian (Norse) word “vin”, it means grass plain. Thus, “Vinland”, the name the Vikings gave to America, means (grass) plain land. You can find the same word in lots of places in Norway, for instance Granvin (pine tree plain) and Björgvin (the older name for Bergen, birch plain). Face it, you’re in denial, and denial isn’t good for your mental health. One update: the startling revelation that 2009 may have been the 2nd warmest year on record, even despite that solar radiation is close to its cyclical minimum. It is a matter of fact that there was a medieval warm period just 800 years ago where temperatures were higher than today. That’s when Greenland got its name and and the vegetation was different here in Scandinavia.